Buy Tara M. Clapper a Coffee. ko-fi.com/tarathebard - Ko-fi ❤️ Where creators get paid by fans, with a 'Buy Me a Coffee' button. Hello! 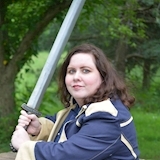 I'm Tara, a game designer, editor, and writer with a background in content marketing, SEO, and editorial strategies. I love to help people! I've chosen to chase my dreams and make my living as a game designer, writer, and editor - on a freelance basis. I also spend a considerable amount of time offering up advice and helping people get started. However, bills don't pay themselves, and I can't continue to do that for free. If I give you some of my time or if you rely on my expertise, please consider a small, one-time donation using ko-fi. A big thing I need to work on: I have a LOT of trouble asking to be paid for my work and expertise. I know I've also taken from the karma bank - but I've put a lot in, too. I'm not asking for massive consulting fees, but if you consider my time and advice to be of value - especially on a niche topic - please toss in a few bucks! Who is this for: Anyone who considers my advice and expertise to be of value. Someone who can pay it forward if I've helped you a lot in the past! If we don't have regular contact or a personal relationship but you contact me every now and then for advice, please consider dropping a few bucks in! This is also for anyone who enjoys my streams and wants to toss in a few extra, though that certainly isn't expected. Who is this not for: Friends who are also struggling and just need to get ahead. Game designers and other service providers who offer me comp or significantly discounted tickets in exchange for the labor, support, and advice I provide. (The LARP community is great about this - I recognize and thank you!) This is also not for anyone providing regular work to me, referring me consistently, or performing an exchange of services, formal or informal. Secured Payments. Support goes to Tara M. Clapper's account. Upgrade Tara M. Clapper to a yearly Gold Membership with a one-time payment.